Earlier this month, speed-loving sailors of all varieties descended on Miami, Florida for the most recent edition of the Foiling Week regatta. A coming together of all matters foiling, the event played host to classes like the Moth, UFO, and C Cat, as well as speakers, manufacturers, and more than a few top-gun sailors. 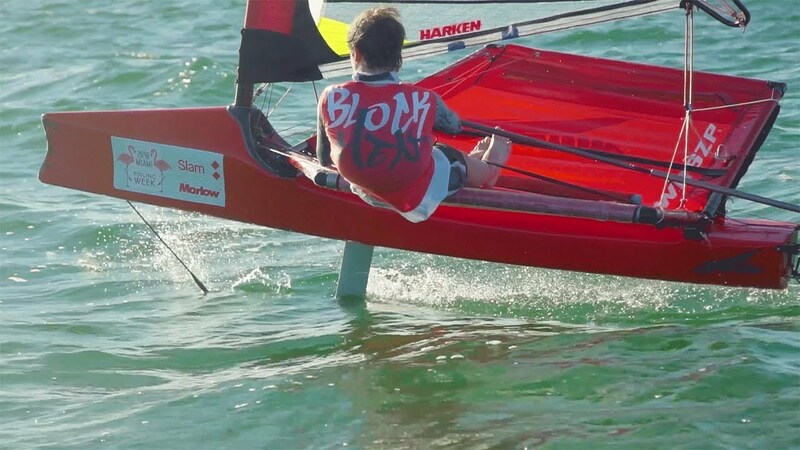 Amidst all this foiling awesomeness was the Harken Kidz Trials. Selected from 100+ entries, six youth sailors were invited to Foiling Week for two days of coaching and sailing in the Waszp. The Waszp is a simpler, one-design take on the famous Moth. The kids were fortunate to have two great coaches on-hand: Reed Baldridge, U.S. Waszp Class President, and Jorge Madden, Training Program Director at Oakcliff Sailing. As was expected, the breeze proved fickle and elusive each morning. This presented an opportunity for the kids to drop in to the Gurit Forum for a few sessions, where they heard insights from designers and sailors pushing forward the leading edge of sailing. Once things heated up, the early afternoon brought with it a moderate breeze, just strong enough for foiling. After learning the ins and outs of the Waszp and its control systems, the sailors all piled into a coach boat and set out onto Biscayne Bay. Through no shortage of capsizes and nose-dives, each sailor repeatedly worked to refine their new set of foiling skills. Eventually, everyone was taking to the sky!